The bucket will contain an equal mix of 2mm, 4mm and 6mm coarse pellet. 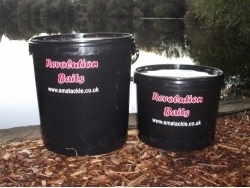 Flavoured to any bait in the Revolution Baits range. These are available in the very successful ranges of either: The SKRILL, BNC (Butternut Cream), The Truffle, Revolution "Enzyme", Revolution SS, Fruit & Nut or Evolution. Select flavour required fom list at top of page!